Discovery : What is the difference between MachAudit and NMAP_Probe ? Discovery deployment error for MAC: Target refused login. Is remote login enabled? Run a scan on a Discovery Network, Deep Scan will get stuck with no "percentage complete" status and no error code. When you check the @MsgQueOut folder in the working directory you can see the XML files generated. While Deep Scan can get stuck for a number of variables, one of the possible reason is that the working directory has been placed inside of the WINDOWS folder. This path is forbidden and Kaseya is not able to monitor and pull the Lan Watch XML files from that location. 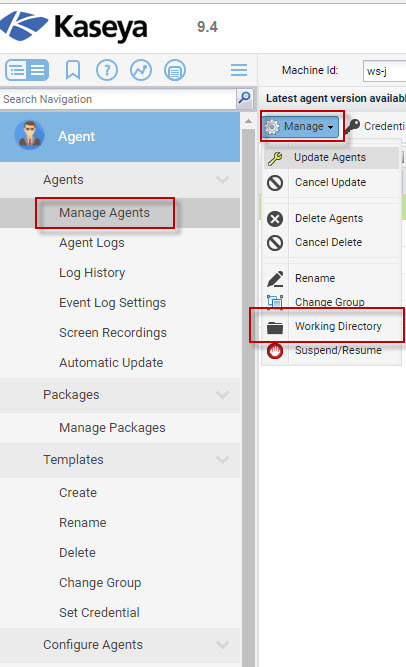 Under Agent --> Manage Agents --> Working Directory, change the working directory for your agents from the C:\WINDOWS\Kworking path to C:\Kworking. Once the Directory has been changed run a new Discovery Scan.